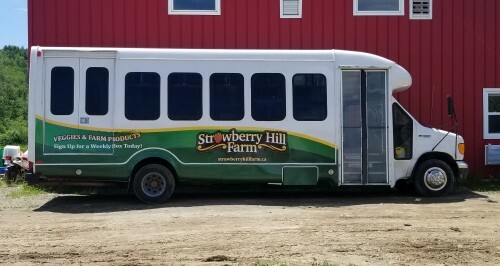 Strawberry Hill Farm is a certified organic family farm in the Saint John River Valley about 7 km outside Woodstock. We grow over 60 types of vegetables and berries plus livestock on pasture. We believe that the fewer the chemicals used to grow our food the better, from the point of view of our families' health, the health of our workers, the environment, and for the sake of our many customers who enjoy the vegetables, berries, and other farm products. In a world where farms are growing ever larger with fewer crops, our objective is to have a farm that is diversified where all parts of the farm work together in a productive and profitable way to support the whole. The farm provides the income for our family while also providing local employment and good organic food at reasonable prices. 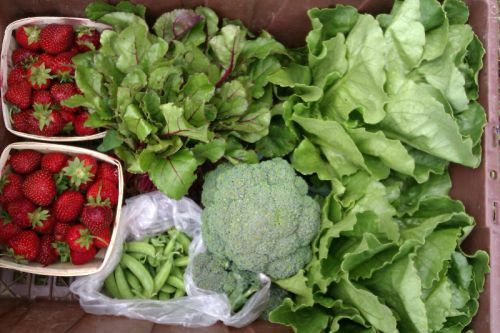 Our main focus is on growing vegetables, fruits, and berries for our weekly vegetable boxes during the summer, fall, and winter. Our cows utilize portions of the farm that are not suited to growing vegetables. Broiler chickens, hens, and pigs raised outdoors are also a key part of our nutrient cycling program and crop rotation helping to create an organic farm system where the many parts work together to produce high quality, nutritious food in a sustainable fashion. To find out more about our vegetable box programs you can to to the Our Box Options page. You can sign up for our vegetable boxes and eggs while quantities last by going to the Member Sign Up page of the website. To find out what is available at our farm store here just outside Woodstock, you can go to the Farm Store page. There are other pages too including pages dedicated to each type of livestock. If you want to keep up with the farm don't forget to check our Blog page as well. 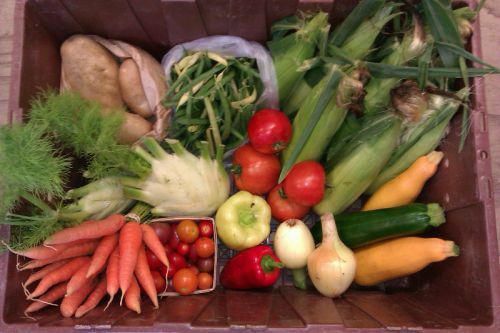 The majority of our vegetables are sold through our weekly box program. We are offering this program for pick up at several locations in the Fredericton, Woodstock, Nackawic, Moncton, Hartland, Florenceville and Grand Falls. When you register for the program, you will be able to choose box size along with delivery locations, pick up times, and days of the week. You will have your own customer profile on our website from where you can see future orders and from where you can add additional items to your box depeding on location of pick up. If you have any trouble with your account or forget a password, just let us know and we can help you get set up. This above box is a picture of a mid summer box from last summer. This box to the right was an early July box. The first boxes have more greens and fewer items until more crops mature. 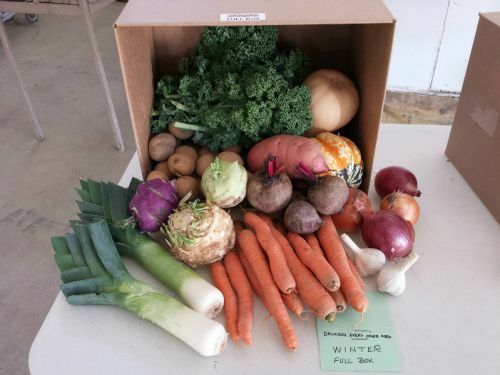 Generally by the fourth box of the season the boxes fill out to 10-12 items weekly and the value is more than made up for in the remainder of the boxes through the summer and fall. To the left is a sample of a winter box. Our winter boxes contain a surprising array of vegetables making winter cooking fun and enjoyable at a time when there is limited local produce available. Feel free to send us an email from the email link at the bottom of the page. We also invite you to follow us on Facebook and Twitter using the links at the base of the page.